It is June 6, 1944, and a fleet of battleships are in position for a large-scale, Allied invasion in Normandy, France. Among the ships sits the mighty battleship USS Texas, firing upon German enemies present along the shore. This special exhibition pays homage to the last dreadnought in existence in the world, the Battleship Texas, commissioned 100 years ago. The ship is a veteran of Veracruz (1914) and both World Wars, and is credited with the introduction and innovation of advances in gunnery, aviation, and radar. 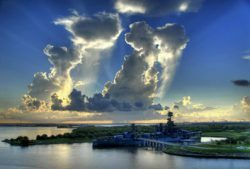 In 1948, the decommissioned Battleship Texas became the first battleship memorial museum in the U.S. and today is anchored in the Houston Ship Channel in La Porte. Texas Parks and Wildlife Department took over management of the historic ship in 1983. A little over 1000 men lived aboard the Battleship when commissioned; that number increased to over 1,800 during World War II. The Battleship’s long history includes being the first U.S. Navy vessel to house a permanently assigned contingent of U.S. Marines, the first U.S. battleship to mount anti-aircraft guns, the first to control gunfire with directors and range-keepers (analog forerunners of today’s computers), the first to launch an aircraft from a catapult, and one of the first to use radar equipment in the U.S. Navy. The U.S. Navy transferred Battleship Texas to the State of Texas in 1948 and, for over 65 years, the ship has been open as a public memorial at the San Jacinto Battleground State Historic Site. Because of the Battleship’s age, key structural areas are in need of repair. The Texas Parks and Wildlife Department is currently making critical vessel repairs to the ship’s “skeleton” so that the ship remains strong enough to hold herself up. During the invasion of France, Battleship Texas dealt out some heavy blows, and took two direct hits from German coastal defense guns. Only one of the shells exploded after it struck the ship on top of its conning tower. The explosion blew the decking in the bridge upward, killing the helmsman, Christen Christensen, and injuring thirteen of the crewmembers manning the bridge. One of the injured crew, Emil Saul, spent two and a half years in the hospital after sustaining extensive injuries in the explosion. Because of Saul’s injuries, the ship’s crew awarded him the battle ensign that flew over the ship at D-Day. Saul donated the ensign back to the ship in 1992. The other shell that struck the ship did not explode. It penetrated the ship’s hull above the armor belt and landed in the stateroom of the ship’s clerk, Warrant Officer M.A. Clark. The ship’s crew did not know the shell struck the ship until a damage control party found the shell toward the end of the engagement. The shell was deactivated and returned to the ship as a good luck charm.